I loved C.S. Lewis’s Narnia books when I was a kid. I read the whole series, one right after the other, and was disappointed when I got to the end and had no more Narnia books to read. I had no idea at the time that it was all a thinly veiled religious allegory, I just loved the story. I’ve since forgotten much of those books, but one thing that stuck with me through the years was a plot point in the third book, Voyage of the Dawn Treader, in which the kids go in search of the end of the world, or as they called it, “the utter east.” That’s where we went today. 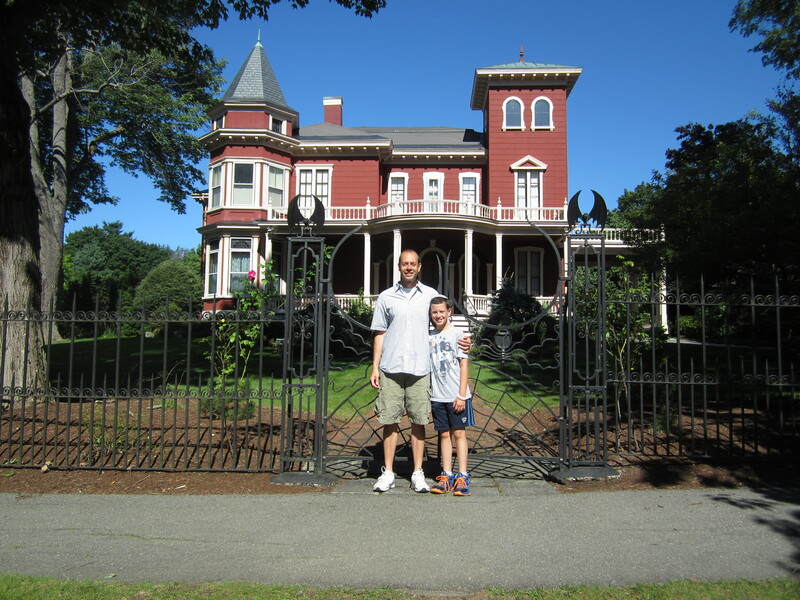 We started the day at Stephen King’s house, however. We slept in Bangor and I didn’t want to leave town without at least having seen King’s house. We didn’t know the exact address, just the street it was on, but it wasn’t that hard to find, what with it being the only house in the neighborhood with large iron bats and a spider web adorning its front gate. What I liked about the house was that it’s in an actual neighborhood, as opposed to being completely secluded on a massive estate behind giant walls and hedges, as you might expect from a famous mega-millionaire. It’s in a nice but unpretentious part of town, which I think says as much about the guy as the bats on the gate do. Anyway, our next stop was a bridge. When I started researching things to do in Maine, the names of three bridges kept coming up. One of them was the Androscoggin Swinging Bridge, which we saw a few days ago. By far the coolest of the three is the Bailey Island Bridge, which is architecturally mindblowing as it’s basically just a bunch of large slabs of granite piled on top of each other with large gaps that allow the rising and ebbing tides to pass right through. I was intrigued, but its location made it completely impractical for us to see it. The third bridge, the Penobscot Narrows Bridge, was almost directly on our route, and appeared to be quite pretty, but not especially exciting in anyway. That was, until I discovered that the very top of one of the two pillars that hold up the bridge’s suspension cables houses an observatory. There are only four bridges in the world that have observatories at the top, and the Penobscot Narrows is the only such bridge in the United States, and it’s the tallest in the world. So that’s where we headed after leaving Bangor this morning. You reach the observatory by taking an elevator at the base of the pillar, which is located in Fort Knox State Park (no, not that Fort Knox, sorry). You actually have to drive over the bridge to get there, which helped increase our anticipation a bit. And the observatory didn’t disappoint. 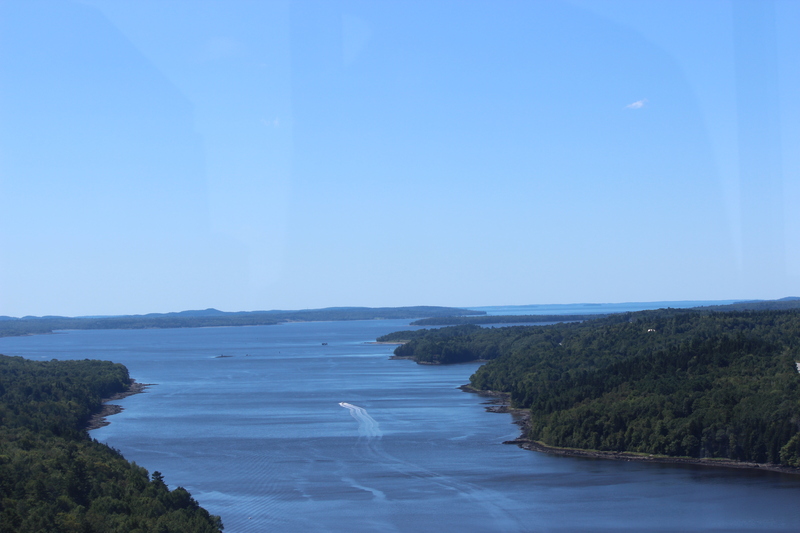 It towers 420 feet above the Penobscot River and everything else around it. No, not the cell tower. 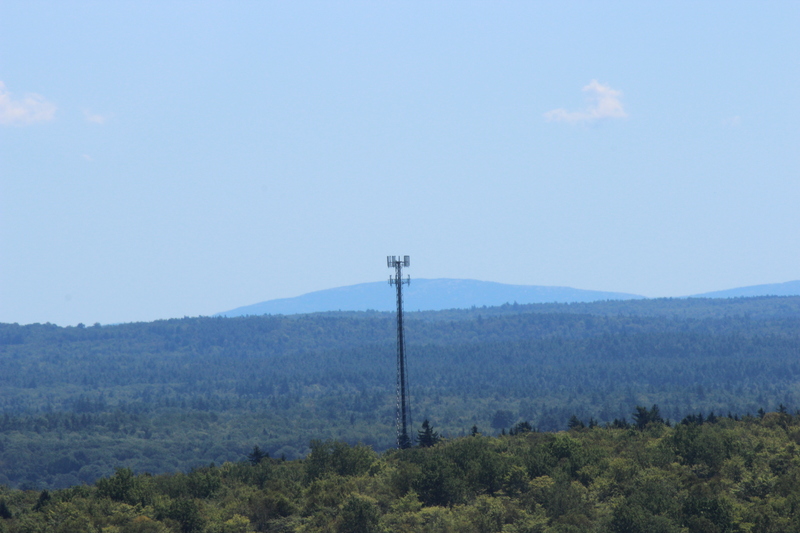 See that mountain in the distance behind the tower? It’s Cadillac Mountain, the peak in Acadia that was covered in dense fog when we were there to enjoy its views a couple of days ago. We may not have enjoyed the view from Cadillac, but at least we were able to enjoy a view of it. 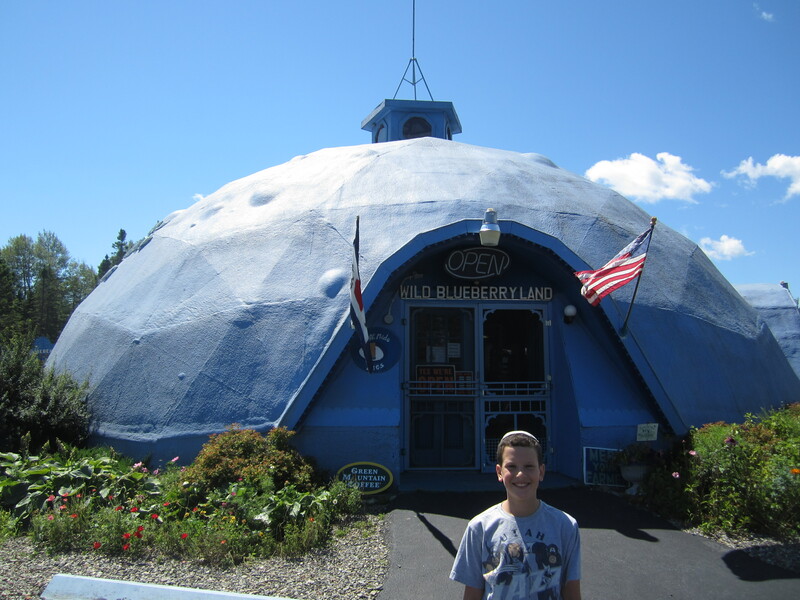 Yup, the store is a giant blueberry. The biggest on earth, they claim. I will say that what matched our delight at the sight of the place was our delight at the smell of the place. As soon as we walked in we were hit with the most incredible aroma of fresh blueberries, and when we got close to the counter inside the smell of the fresh pies started turning into a hand and beckoning us like it sometimes did in the old Bugs Bunny cartoons. One of the most frustrating things about being a kosher traveler is not the inconvenience or the limited options but the inability to sample the local cuisine everywhere we go. Lobster is obviously out of the question, but I figured we’d at least be able to partake in the blueberry mania that is rampant in Downeast Maine. Everywhere we go we see blueberry jams, blueberry honey, and of course the pies. But none of it is certified kosher (and I’ve checked every single one) so we’ve had to pass on it every time. The pies at Wild Blueberry Land aren’t kosher either, but I did finally find one kosher item: canned blueberries in syrup. I know, it probably tastes just as gross as it sounds, but I had to have blueberry something. They were also selling local wild blueberries by the pint, and I snatched up one of those, too. Sam insisted on playing the blueberry-themed mini-golf course that was next to Wild Blueberry Land, which I was happy to do, but all I really wanted was to get into the car and tear into those fresh blueberries as we drove further east. The aroma in the store definitely fed the craving. Finally we finished golf and I got to taste them. And they were so good. These were no doubt the best blueberries I’ve ever had. And they looked great, too. Not like supermarket blueberries, but like individuals. There was no uniformity in size; small ones, big ones, and medium ones all comingled in the container crying out to be enjoyed. Even Sam had a few, and he doesn’t like blueberries. Before I knew it half the pint was gone. The only thing that stopped me from finishing the whole thing was that we got to our next stop. The town of Machias, Maine, is known for two things: blueberry barrens and a handful of waterfalls that gave the town its name. Native Americans named the place Machias after the Machias Falls, which translates to “Bad Little Falls.” We may not have stopped off to see the falls except that they are literally directly under the highway. We immediately understood where the name came from. The falls are not tall but they’re powerful; the water doesn’t fall over the edge, it gushes and jumps and smashes over the edge. It was also oddly colored, especially since upstream the water was blue and several yards after the falls the water calmed and returned to blue. 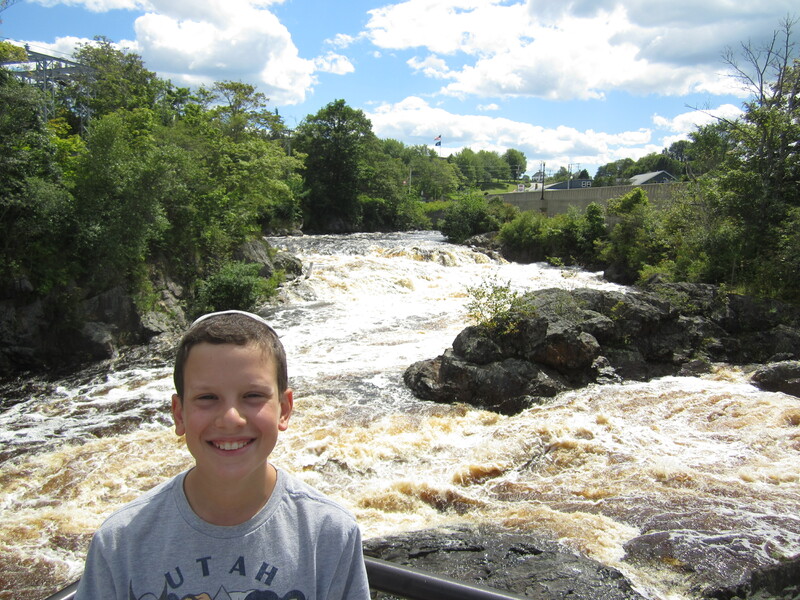 But in its rage over the falls it was brown–Sam said it looked like a Coke waterfall. Once we were done with the falls there was nothing between us and our journey to the utter east. Maine, obviously, is the easternmost state in the U.S. Lubec is the easternmost town in the state. 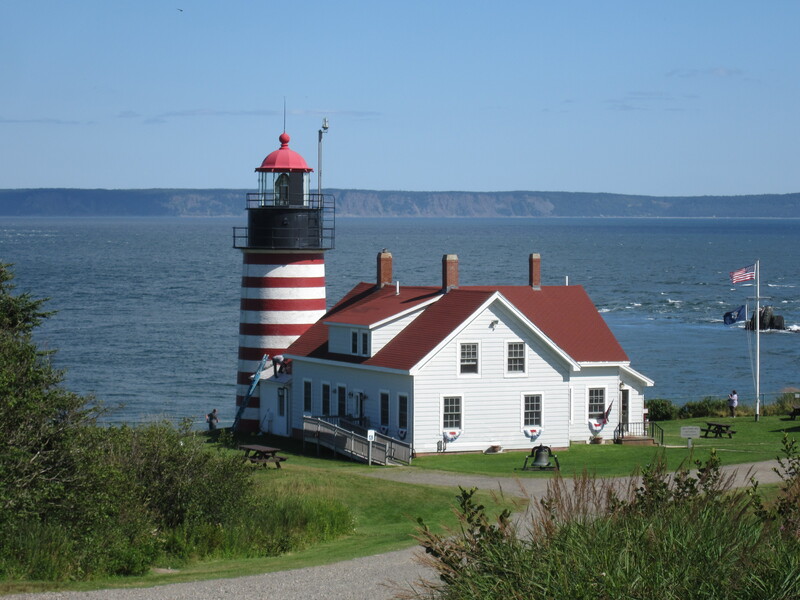 Quoddy Head State Park is the easternmost part of Lubec. The easternmost tip of the park, therefore, is the easternmost tip of the contiguous United States. 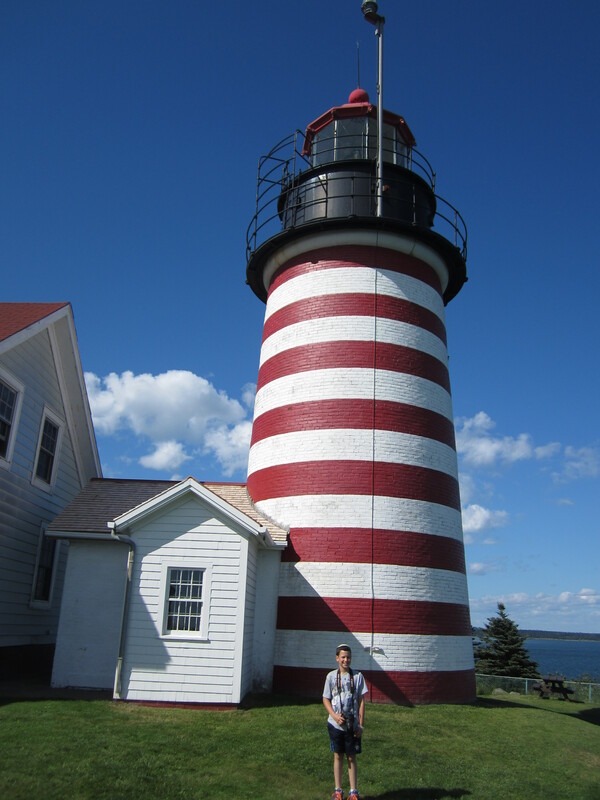 Standing at that tip is the West Quoddy Head Light, an iconic lighthouse painted with wide, horizontal red and white stripes. We love lighthouses and we love extremes and superlatives, so this was a natural for us. The drive to Lubec, through Lubec, and to and through Quoddy Head State Park felt exactly like such a journey should. The buildings became increasingly sparse, the distance between road and water increasingly thinned, cell service waned and disappeared, and Hamster and I remarked to each other how much it felt like we were driving to the end of the world. Of course, we were merely driving to the end of the country, and Canada was just a short distance further east across the Bay of Fundy, but still. There was something specifically adventurous about the trip, as if we were explorers charting new territory. It helped that few people live there and fewer still are crazy enough to trek all the way out there just to see a lighthouse and be really far east. Before we even went to the lighthouse, though, we stopped off at a different part of the park for lunch. Exploring the world can really work up an appetite. And for the second time today we were stopped in our tracks by an extraordinary aroma. This one was of pine and balsam fir, and it was strong and extraordinary. You know those old Pine Sol commercials where the lady said it smelled like she was in a Carolina pine forest? This was way better. 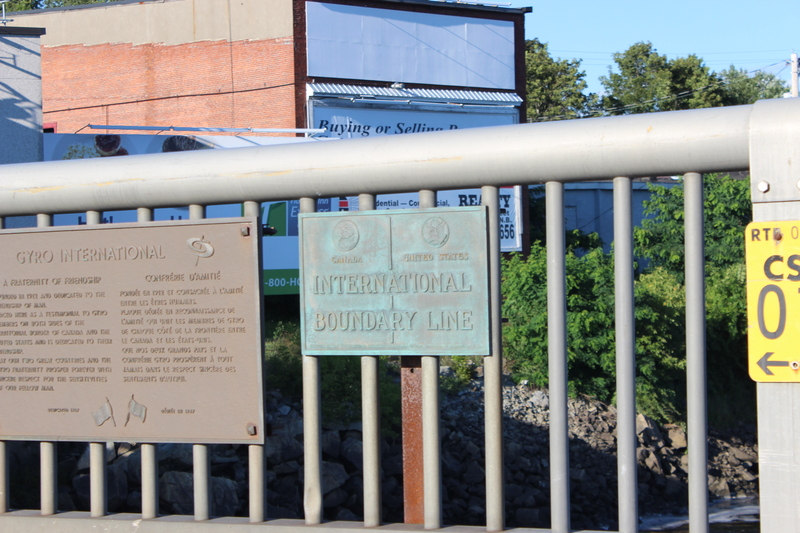 Of course there’s an official marker declaring this to be the easternmost spot, next to which we posed. 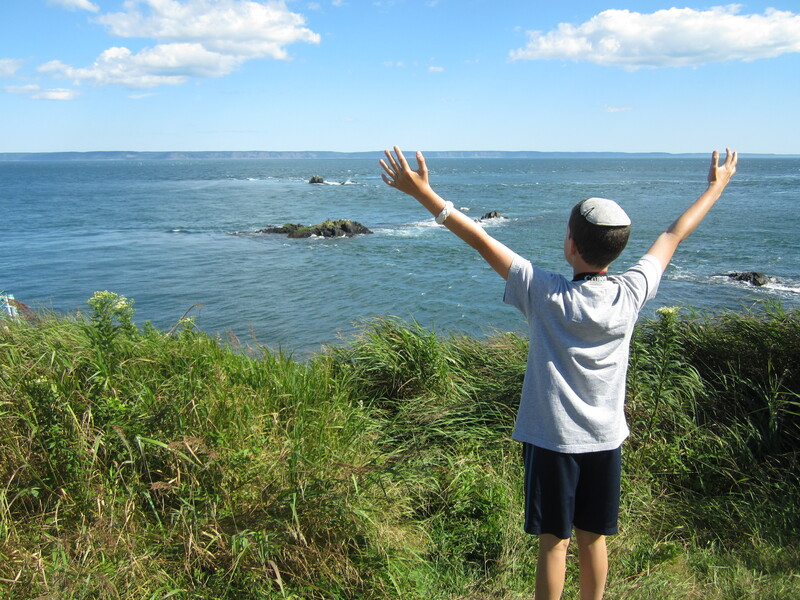 And like he did a few years ago when we were in Hawaii and went to the southernmost spot in the U.S., Sam declared it all as his own. I’m Yertle, the ruler of all that I see! Incredibly, we were not yet done with geographical oddities for the day. We were already the furthest east we could get and we were pretty far north compared to the rest of the country, but we could go further north still. 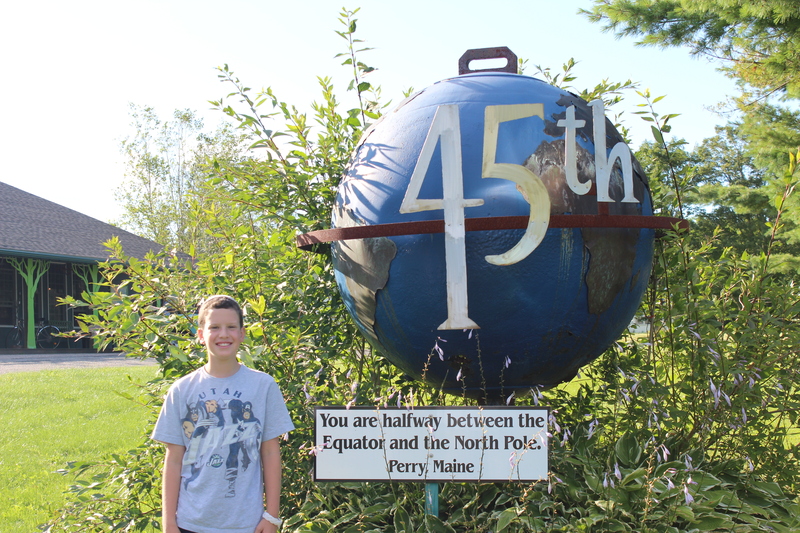 We didn’t have to travel far to get to Perry, ME, where we crossed the 45th latitudinal parallel, which meant we were not merely far north, we were halfway to the North Pole! The sign in the photo is actually outside a gift shop called the 45th Parallel. The official U.S. Geological marker is a few yards up the street, and we took pictures there too, but it’s pretty dull, especially compared to this one. Yup. Canada. The Hamster and I have been semi-obsessed with the Bay of Fundy ever since he learned about Canada in depth in fifth grade. Forty-foot tidal flows! Crazy rock formations! We were planning to see a bit this evening and then some more tomorrow, but I forgot we’d be losing an hour when we crossed into New Brunswick (they’re on Atlantic time, which is an hour ahead of Eastern time), so by the time we checked into our motel in Saint John, NB, it was about 7:30 and both sun and son were starting to fade. Which means that after a day full of superlatives of all sorts, the Regent Motel provided our final superlative of the day: the absolute worst motel I have ever had the misfortune to stay in.